I missed posting a blog last Friday for this, but I just wanted to pop in and say send some wishes to my mom, Sandy, for her BIG birthday this past Friday. I can’t tell you how old she is… except that I’m 31, and though my mom likes to say she was a teenage bride… um… well… 🙂 I’m so lucky to have such a great mom. I love her so much, and I wish we could have been nearby to celebrate with her. Analise and I made her brownies, though, and we’ll see how they hold up after a couple days in the USPS. I love you, Mom!! My sweeties love their Grandma Sandy!!! Happy Birthday!! Josiah says "Salute the cupcake!" where the 3- and 4- year-olds are supposed to come in costume and parade through the rooms for games and treats. and Analise is going to wear it and carry her lamb… Mary Had a Little Lamb. She looked so cute!!! Josiah loved the hay bale maze. He wanted to be just like his sister and climb over the bales instead of walking around them! of me and the kids this weekend. This is one of my favorites. The bumpy ride to the patch on a horse-drawn wagon. Josiah walked ALL THE WAY through the field. It was a big field, and there were lots of vines and bumps to maneuver. right one until right before we got back on the wagon. Couldn’t work my Photoshop magic on this photo, even though there were about 10 to choose from. Analise had a fun time, but it was hard to catch her smiling! Just to whet your appetite… I hope to be back tomorrow with more details and pictures. I’m so tired tonight, though. We’ve had a super fun family fall weekend. Josiah’s pick… the first one he saw after we got off the wagon. He was so cute lifting it up, with all his little "oof…ug.. uh…". *sigh* Where does the time go? A couple more photos from the past few days. I finally convinced Analise to get her haircut on Friday. She did have her hair cut a couple months ago, and it wasn’t a big deal, but this time he was very scared. I could only convince her to do it if I would hold her. Too bad I didn’t get a haircut too… I really need one! So, do we look alike? Last night we started the Halloween festivities with a party at a friend’s house. Analise is a ballet princess and Josiah is a lion. They were both SO CUTE! Our camera takes amazing video, and we’ll have to upload a couple later this weekend for you to enjoy. A pretty princess in my mirror (excuse the dust!). including her friend Gage, who was Spiderman. She cried for the first 20 minutes. Then she found the cool cookies and treats and a fun bedroom to play in and she forgot to be afraid. Thank goodness. Brian, of course, came to the party as Dr. Spandex, in his bike tights, helmet, dress shirt. A true-to-life costume he’s had to wear once for class when he forgot his keys to his office so he couldn’t change before class. My little lion man, who did laps around the living/dining/kitchen area, mostly bc it had 4 steps he enjoyed, with a melted cookie in his hand. The most original costumes of the night: Darryl is Barry Bonds, with syringes sticking out of him. And Laura is Michael Vick (it says "ConVICKt" on the back of her jersey). So funny. Josiah loved the dog attached to her leg. He kept petting it and giggling. Another person showed up with a gorilla mask, and Josiah also loved that. Quite a contrast to his sister! Pumpkins, Playgrounds and Pictures a Plenty! We had a fun family day today… trekking through the woods to the elementary school playground, visiting a local church that had pumpkins for sale, enjoying a nice family naptime and a yummy dinner together. I love relaxing fall weekends! A serious look from my handsome little man. All smiles before diving down the slide! Brian caught this one, too. I like the angle and offset cropping. Analise picked her pumpkin! She had $6 to spend from Grandma Vivian, and this was the lucky one. Isn’t this great?? You’d never know… all the pictures only showed one of their faces, none with both. I spliced two photos together. Magic! I think it looks AWESOME! My camera arrived yesterday afternoon! I haven’t had a chance to do much with it except pester poor Josiah while he’s playing. He woke up from his nap to find me waiting with my new camera, testing out the flash:) Poor guy. He wants to get his hands on it, though. Here’s 3 quick shots that I resized (though you can hardly tell! They were 2MB each and more than 3264×1944!!) and sent to my mom yesterday afternoon. Hope to be back soon. It’s really nice – I’m so excited! Analise ready for church last night in her super cute halloween outfit. J hamming it up during dinner. Ok, the first visit to Stride Rite with Analise was fun and novel. We cringed a bit at spending so much for shoes, but it seemed worth it for the first pair. She got one other pair from SR a year later, but she didn’t wear them as much as sandals from Target, so I’m done spending $$ on SR shoes for her. Josiah’s first shoe-shopping trip (um, didn’t get the blog coverage – sorry!) was fun, and definitely necessary. We had bought a pair of sandals from Target for him, but they were too small. So I took them back for a larger size. Still didn’t fit. So when we finally decided we needed to get him sized at SR, we found out he was a 5 EXTRA WIDE. Ok, so Stride Rite was definitely where we needed to buy shoes. And his first pair were cute sandals that he wore all summer long. Just in the last couple weeks, they’ve been too small. coming soon… a new camera! Anyway! 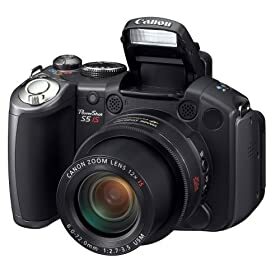 The most exciting wonderful news is that I ordered a new camera, a Canon Powershot S5 IS. I am SO VERY EXCITED. It will be so nice to have a camera that takes pictures quicker than ours did. We were having a tough time capturing the fleeting cute moments, as our camera was just a split second too late. I’ll spare you all the details, since you can read them yourself (and probably understand them better than us if you’re the kind of person that would be reading camera details anyway!) except that this can take up to 30 minutes of video! Ummm… compare that to our 30-second video clips. Sweet. It’s coming UPS, and it should be here Wednesday. We picked up a new 2GB memory card tonight, so we’re ready when it gets here (bc the 32MB card that comes with it will hold like 4-full size pictures!). Stay tuned! There’s likely to be an upward trend in photos and video posted on the blog… It’s going to be exciting!